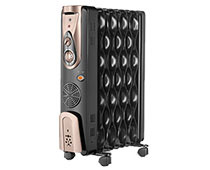 Oil filled radiators, also known as oil filled heater, oil heater or column heater is a typical form of convection heater used for domestic heating. 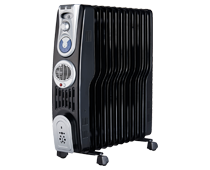 Though it sounds like it runs on oil from the name, the oil is actually used as a heat reservoir or a buffer and not as a fuel. 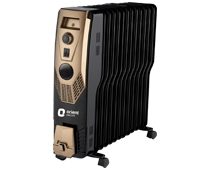 Orient Electric presents a range of oil heaters which will help keep you warm in winters and regulate the temperature of your room to create a comfortable space. 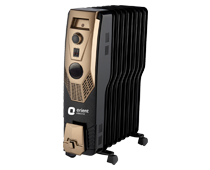 Orient Oil filled heaters have a variety of features which are different from other brands in the market, for example, they have 3 rd generation advanced shape fins for better heat distribution, 3 heating positions for controlling the rate of heating, triple overheating protection to ensure that the room doesn’t get heated beyond a certain temperature, adjustable thermostat which helps in setting the ideal room temperature, caster wheels to move the device easily to any desired location, 360Degree trip over safety switch which works as an additional safety device in case the oil filled radiator falls or if not placed vertically, cord storage facility which keeps the cord wire tangle free when not in use, inbuilt handle provision which makes moving around of the oil filled radiator a convenience and a PTC Fan Heater when you need an additional boost of heating.